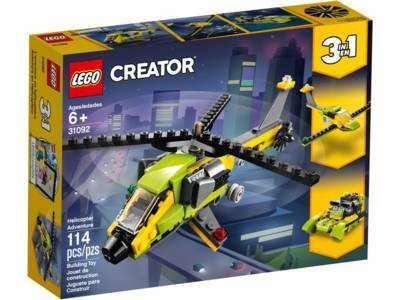 Build and pilot awesome machines with the Helicopter Adventure set, featuring a hi-tech helicopter with a fresh green, yellow and black color scheme, tinted cockpit, large engines and adjustable landing gear. Spin the main rotor and head out on exciting aerial missions! When you're done, rebuild and enjoy high-speed water adventures with a cool Power Boat or soar silently through the air with a sleek Glider Plane.